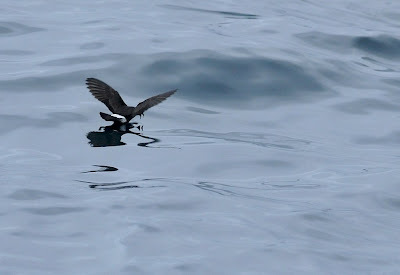 This dedicated seabird pelagic was the first to be organised for several years from mainland Cornwall. 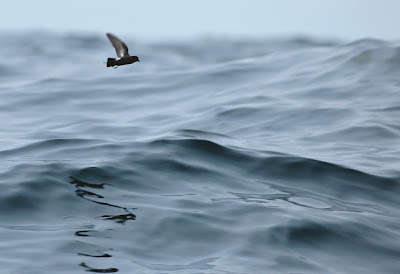 The main intention was to see Wilson's Petrel off St Ives. Twelve of us sailed for about seven miles today from 5am and eventually found a likely spot. 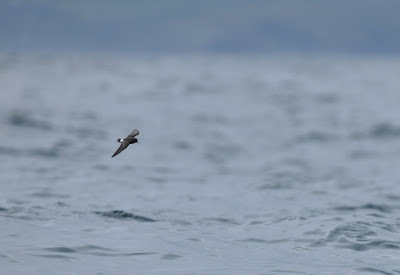 We chummed immediately with a mackerel mixture and within 30 minutes, about 40 Storm Petrels and 2 Wilson's Petrels appeared on the slick, all giving fairly close views. However, there was a decent swell and given the small size of the boat, there was some considerable difficulty in obtaining respectable shots. 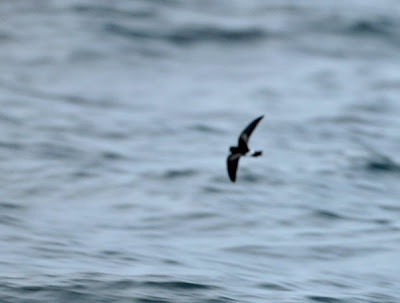 I did manage to photo the Wilson's Petrel but sadly only one shot of mine was barely publishable. Two shots taken by Thor Veen are also shown below. 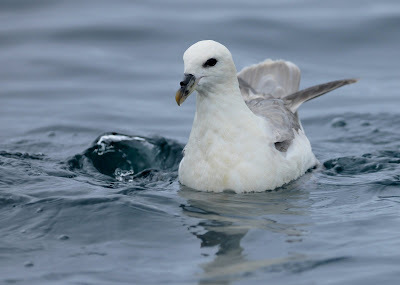 Fulmars were the first birds on the scene and they approached the boat to within ten feet. Despite the close distance, the movement of the boat made photography and general viewing surprisingly difficult. 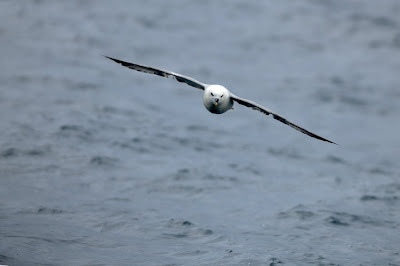 The picture below shows a Fulmar virtually looking into the boat at point blank distance. 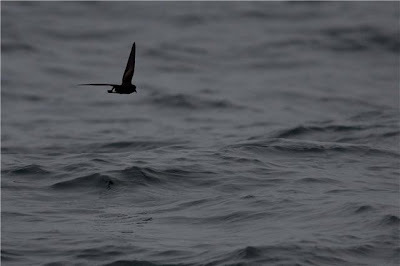 Wilson's Petrel: The image above and below was taken by Thor Veen on this Pelagic. 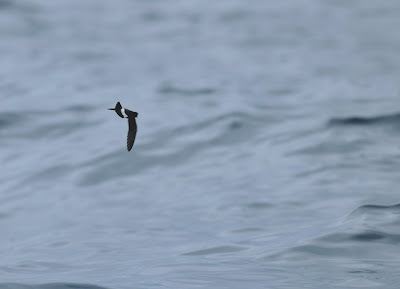 The image below is the only publishable shot of the Wilson's Petrel I could manage. 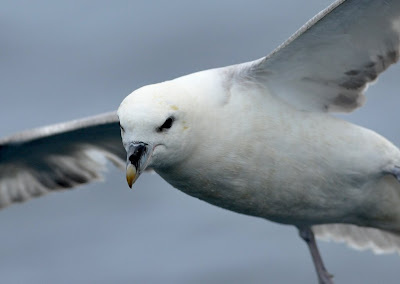 The long wings and pale carpal bar as well as a barely noticeable leg projection can just be seen. 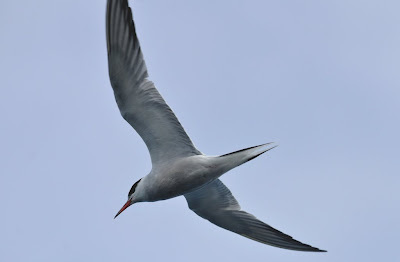 Several Common Terns investigated us but flew on. The bird below was about 20 feet above us. 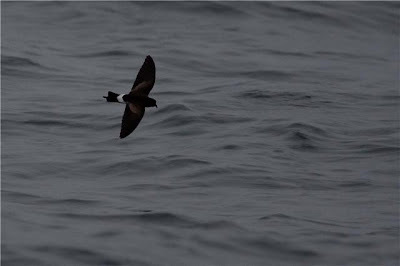 The petrel images below are all Sorm Petrels. 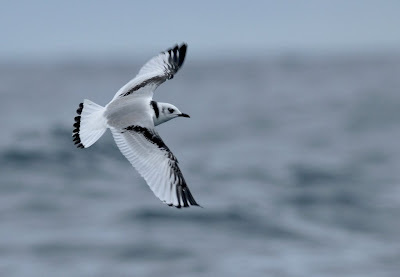 These tiny little ocean wanderers fly remarkably quickly and it takes a lot of practice keeping them in the view finder, let alone maintaining sharp focus. Of the 500+ shots I took, approx ten were in focus and just five worth publishing here. 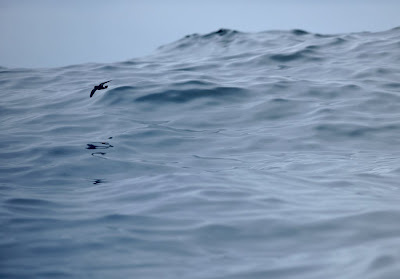 The combination of vibration of the boat's engine, massive heaving and movement of the boat, hand-held camera shake and of course fast flight of the bird all combined to make sea bird photography quite tricky. I quite like the shot below. It's a bit "arty" but the miniature petrel set against the awesome size of the sea swell and bird's shadow make this image one of my favourites of the day. The good ship Freestone below. 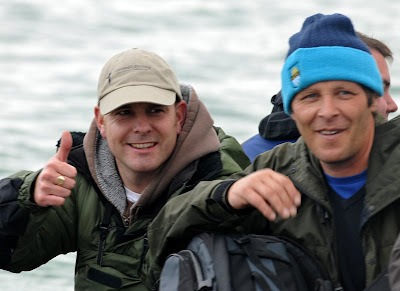 Paul Freestone and Mark Halliday above looking sea sick but content at the end of today's Pelagic. 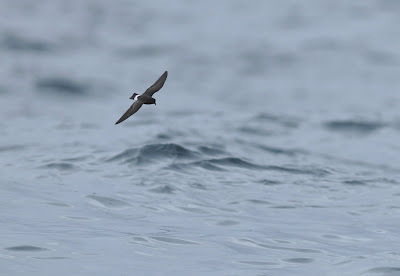 For those of you interested in the logistics of this trip, Paul Freestone of Cornwall-Birding.co.uk organised the trip as a one-off event simply to see Wilson's Petrel off the Cornish coast. The tongue-in-cheek vessel was in fact a slightly larger fishing boat with a standing room for twelve people. 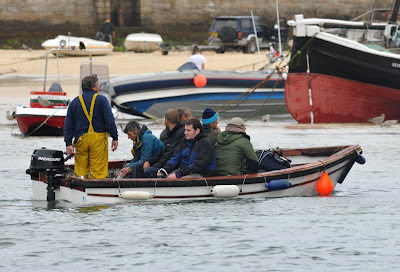 We sailed from St Ives harbour at 5am and returned at 11am, costing £35 each. Chum mix was organised by ourselves. For anyone wishing to organise a trip from outside the county, I would say the chum is the more difficult part to organise. In addition you require a chummer. Royston attempted chumming on this trip and was sea-sick, as was I simply standing by the putrid stuff. The guys on the Scillies do a fantastic job but have been finetuning the art for some years, so don't expect to be a skilled tradesman in a day! Superb photo's . 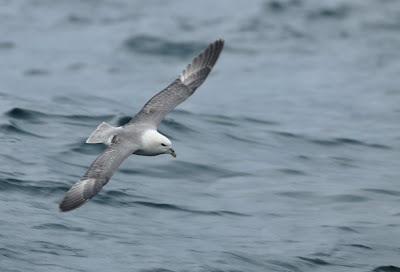 I've got the ID of the Wilsons now and the Fulmar are the best I have seen considering the conditions. Hi Steve. 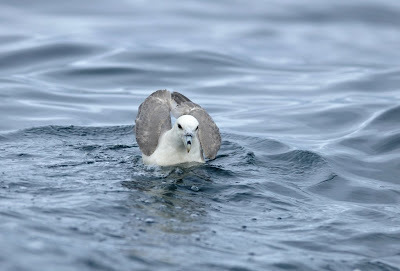 Just discovered this blog, and feel compelled to add it to my own links - with such a cracking selection of lovely photos, plus first-hand accounts of the PG Black-browed Albatross and N Cornwall Wilson's Petrels, who could resist?